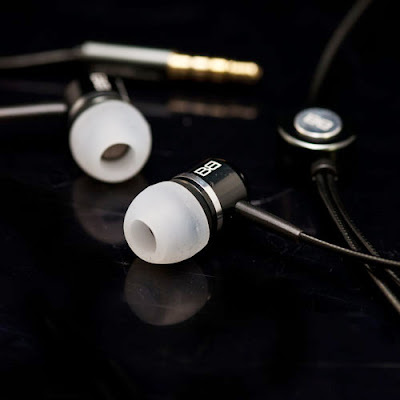 This is my product review for BassBuds, stylish in-ear headphones. I received a pair of BassBuds to review, and I was given a discount code to share. If you decide you want to purchase here is the discount code: BB59785 (scroll down for more info below). I rarely review products I'm normally offered things I don't want or use, but I was excited about receiving the earphones. BassBuds are earphones (the go in your ear) and I listen to music all day long, so I graciously accepted this gift in exchange for a review. The company is based out of the UK and the product is being sold as a high-quality headphone, that is hip and stylish. You can listen to music and talk on your mobile, because these earphones have a mic, you can use them as a cell-phone headset. They are compatible with all smart phones, which is a huge plus. I imagine you can also use them to Skype, though I have not tried. My earphones arrived in a lovely box and a soft white pouch. I liked opening the package, I felt like a lot of care had gone into the design of the box, so I anticipated a superior looking product to be inside the box. 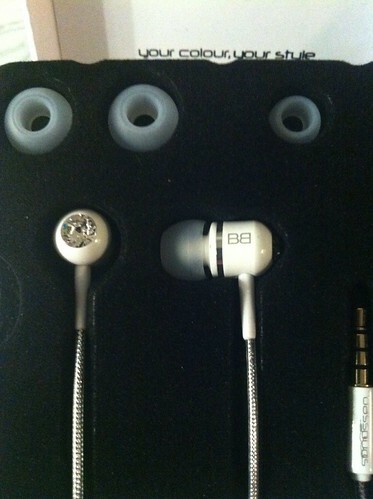 I was delighted to find a sleek looking pair of white earphones with a small crystal embedded into the earphone area. The sounds quality of BassBuds is quite nice. BassBuds make some claim on their website about Crystaltonics sound quality but I don't know what that means. In my experience, BassBuds fall in the middle to high range of quality for sound, perfect for what most people need on a day-to-day basis. If you're like me, just trying to drown the voices of your officemates until quitting time, BassBuds earphones are great. However, don't expect the quality you would receive from a $200 or $300 pair of headphones. BassBuds are moderately priced, about $55.95 (pricing on the website is in GBP). They are priced lower than their competition (see BassBuds website for a comparison grid), and they are certainly priced lower than my Bose earbuds. BassBuds also claim to have a "tangle free" cord. I've only owned these earphones for about two weeks so I cannot say whether or not they are truly "tangle free". I will say, if this claim is true, this is a great touch. I've gone through two sets Bose earbuds due to the wires falling apart. The wires coming apart are generally caused by what is considered careless use (throwing them into my purse or work bag), but to me, that is normal use. I'd love to know that I don't have to take cautious measures to protect the wires of my earphones. Another bonus, you can Play, Pause or Skip songs with the circular piece that is on the cord of the earphones. Not a feature I used a lot, but I can see where it would be useful if I was at the gym. I was not too sure how I felt about the look of these Swarovski Crystal adorned earphones when I first opened the package. But after perusing the website, they do look fun and they add a touch of personalization. I found that they have two different styles of earphones - Classic Collection and Fashion Collection. The earphones come in about 20 colors: white, hot pink, electric blue, black, and more! 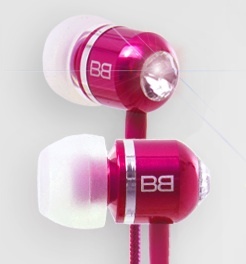 Every color earphone has a clear Swarovski Crystal embedded into the earphone area. The crystal is small, you don't really notice the sparkle unless you're looking, and the dark colors do seem to look a bit more masculine. I've only owned these for a few weeks, so I can't say I know everything yet. I did not try the mic and the headset on my cell phone (or skype). I do not use a headset when I talk on the phone, therefore I cannot speak to the quality of the mic and headset when used with a smart phone. The earphones also come with three sets of black and three sets of white memory foam earbuds. The white set did not work for me at all, my left ear rejected them - they would pop right out. The black set is softer and molds more quickly to the shape of your ear. The black set is still not as comfortable as my Bose earbuds are, but then again, it took me a while to get used to the fit of my Bose earbuds. It may take a bit of time for the memory foam to "learn" the shape of your ear. I was also given an offer to share with everyone. 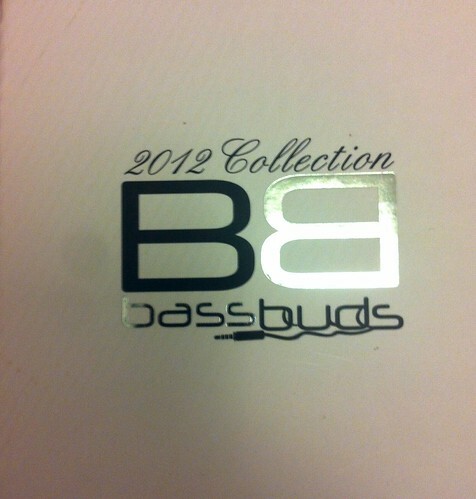 If you click on this link and purchase a set of BassBuds, use BB59785 you'll get $30 off your earphones! That's a pretty sweet deal. I like that they gave such a nice discount, makes me want to share it more. I'm not sure how long this offer lasts, so go now! If you have questions - leave a comment below OR tweet me @leyla_a , I'll reply.